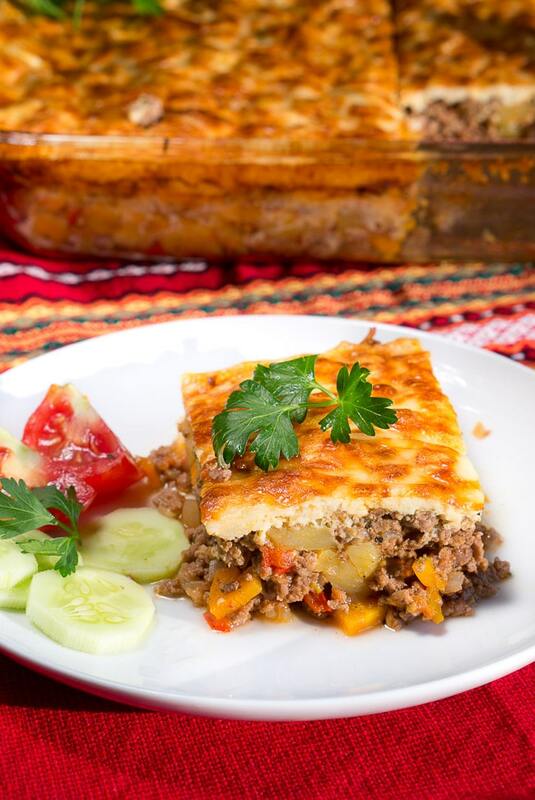 Bulgarian Moussaka Recipe – A delicious traditional Mediterranean dish made with potatoes, vegetables, and ground beef. Since my mom and grandmother were visiting us last month, we cooked a lot of traditional Bulgarian meals. 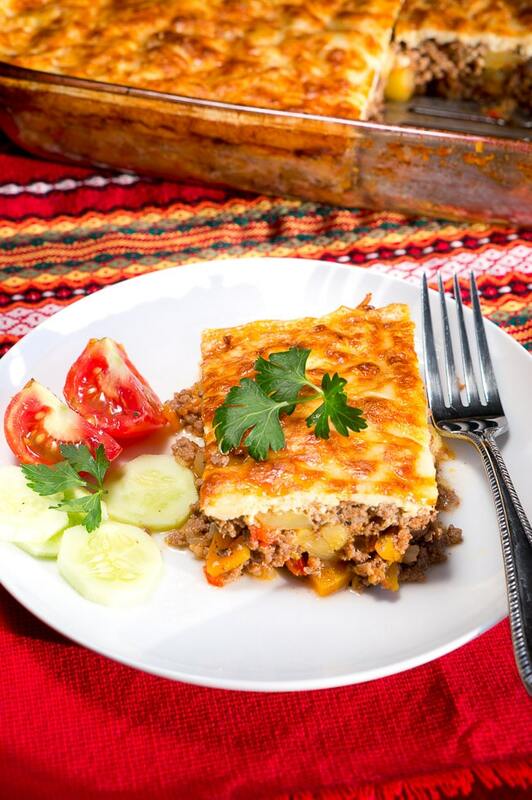 And today, I am sharing with you one of my all-time favorite Bulgarian meals – Moussaka. 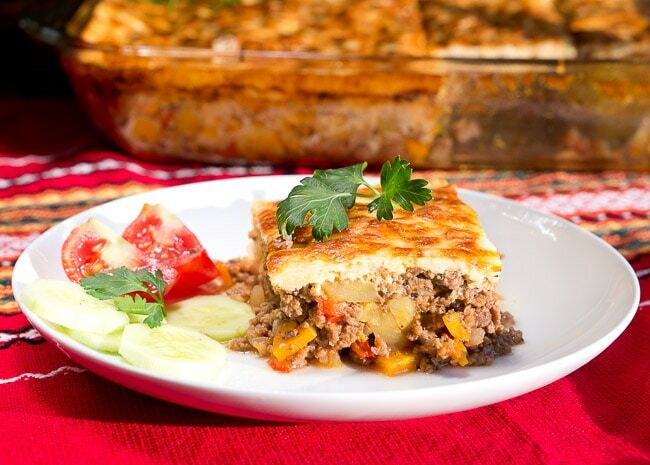 This is a traditional moussaka recipe made with potatoes, ground beef and vegetables like carrot, red bell pepper, celery, tomato, onion, and garlic. It’s absolutely delicious and I bet you will ask for seconds. It can be time-consuming to make moussaka but I love that it’s a great meal for large crowds – it’s enough to feed 10 people. Considering that you cook for about 10 people, spending an hour in the kitchen prepping and cooking is really not that bad. It’s actually a pretty quick meal. I have made several moussakas and I finally was able to make one that takes only about 1 hour to make. I think this is the quickest moussaka recipe I have ever cooked. One trick that I have come up with is to sautée the vegetables and ground beef before they go in the oven. It’s a timesaver, and it lets the flavors combine nicely. This moussaka recipe is a perfect comfort food. I don’t think moussaka is a very popular meal in the States but it certainly has become more popular in Europe over the last decade. I love that the ingredients are super simple, everyday pantry staples, and there are no complicated techniques to cook this meal. This quick and simple moussaka recipe is also healthy – I used only vegetables, ground beef, eggs, yogurt, and spices. 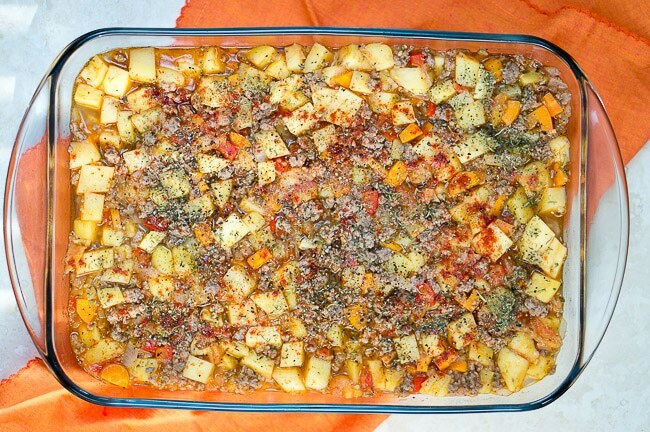 For Paleo version – substitute potatoes with sweet potatoes, and milk with almond milk. Also, omit the shredded cheese. I hope you give this moussaka recipe a try and hope you enjoy it! Transfer vegetables to a plate. Add ground beef to the skillet and cook for about 6 minutes until brown. Season with salt, pepper, paprika, summer savory & cumin. Break it up into small pieces with wooden spoon. Mix vegetables and ground beef together. Transfer to a 9 x 13 greased baking dish. 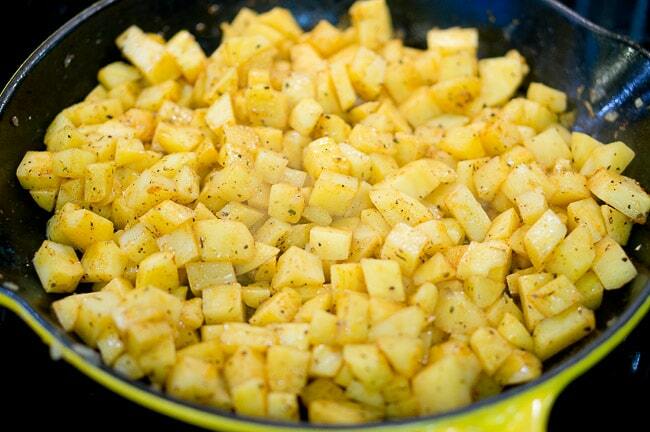 In the same large skillet heat oil and add HALF of the chopped potatoes (cook them in batches as you want them to cook evenly). Season with salt, paprika, freshly ground black pepper and summer savory. Let potatoes cook covered for about 10 minutes until slightly tender (they will cook more in the oven later) and stir every couple minutes. When the potatoes are done, add them to the beef and vegetable mixture in the 9 x 13 baking dish. Repeat with the second batch of potatoes. Place in a preheated 400 F oven and bake for about 50 minutes, or until most of the water has evaporated and the potatoes are tender. About 10 minutes before moussaka is ready, prepare the topping. Beat 4 egg whites with a mixer until fluffy. In a separate bowl beat 4 egg yolks with a mixer and add 4 Tbsp water. in another small bowl, combine 1 cup yogurt with 1/4 cup milk, and add 1/2 tsp baking soda, gently fold in egg yolks and egg whites. Add a pinch of salt and freshly ground black pepper. Spread over baked moussaka, top with freshly shredded cheese and bake for another 10 – 15 minutes. Let moussaka cool for about 15 minutes before cutting. Enjoy! 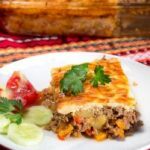 Bulgarian Simple Moussaka Recipe - A Delicious traditional Mediterranean dish made with potatoes, vegetables & ground beef. One pan meal. Heat oil in a large skillet on the stove over medium-high heat. Add chopped onions and saute until lightly translucent (about 2 minutes). Add chopped carrots, celery and red bell pepper, season with salt and saute until vegetables are tender (about 3 minutes). 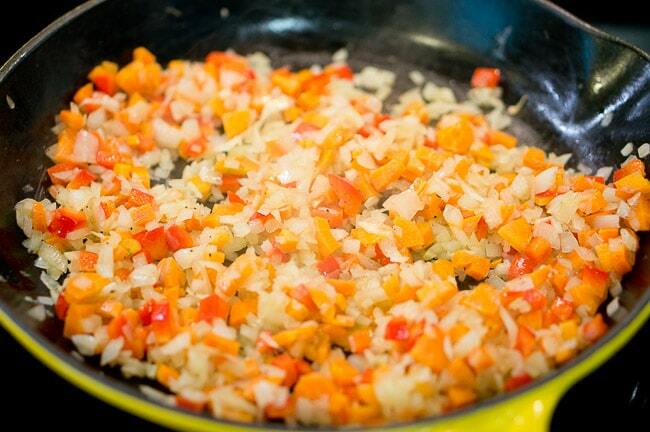 Add finely chopped tomato to the skillet and minced garlic, and cook for few minutes until it looks like sauce. Season with freshly ground pepper, paprika, and summer savory, and stir well. Place in a preheated 400 F oven and bake for about 50 minutes. About 10 minutes before moussaka is ready, prepare the topping. Beat 4 egg whites with a mixer until fluffy. In a separate bowl beat 4 egg yolks with a mixer and add 4 Tbsp water. in another small bowl, combine 1 cup yogurt with 1/4 cup milk, and add 1/2 tsp baking soda, gently fold in egg yolks and egg whites. Add a pinch of salt and freshly ground black pepper. 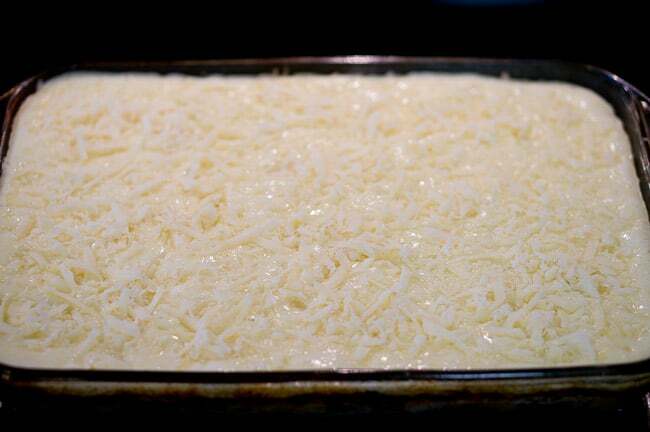 Spread over baked moussaka, top with freshly shredded cheese and bake for another 10 - 15 minutes. Let moussaka cool for about 15 minutes before cutting. Enjoy! Thanks, Molly! Yes, it was super delicious! This should be more popular here in the US. It looks amazing. I know it is on my list now for winter. Thanks! I have never made it and I can’t wait to try something new. This looks like such a wonderful dinner Neli! My family would love this. I can imagine it would be a great meal especially in cooler fall weather. Can’t wait to try this! I love moussaka but have never made it at home, this sounds wonderful, I will have to give it at try! I had a good chuckle, an hour in the kitchen for 10 people…I easily spend an hour in the kitchen for just two, but I love it, so not complaining. I have never had moussaka. But I love everything about this. That’s a great dish for a group! Sounds delicious. And, yeah, the time is perfectly reasonable for what you get – a one dish meal for a bunch of people. You could easily spend as much time cooking meat, vegetables, and potatoes separately. This dish looks lovely! I’ve eaten moussaka many times, but never knew what the topping consisted of. Good to know! Fantastic, vibrant photos too! Oh my, this looks amazing! It kind of reminds me of shepherds pie in a way, which is a huge hit in our house so I think we might need to branch out and try moussaka sometime soon! uh-hh – Topping ingredients not listed in recipe … ?! Ali, I am SO sorry the topping ingredients were not listed in the recipe card. I don’t know what happened… I updated the recipe card. Hope it still turned out delicious! What kind of cheese did you use for this recipe. My best friend and her Bulgarian husband are coming to visit tomorrow and I wanted to make something Bulgarian, which I guess this is the quintessential Bulgarian meal. Yes, this is authentic Bulgarian meal. You will love it! Wha kind of cheese did you use to top the moussaka? My best friend and her Bulgarian husband are coming to visit tomorrow and I wanted to make something Bulgarian for dinner. Hope this works, just don’t know what kind of cheese to get. Hi Emily, it’s made in a 9 x 13 casserole dish. So that’s about 8 servings. Thank you for the lovely recipe. I’m Canadian but I’ve spent time in Bulgaria, and I just made this exactly to your specifications as I miss Bulgarian food. It came out perfect, and my parents absolutely loved it! 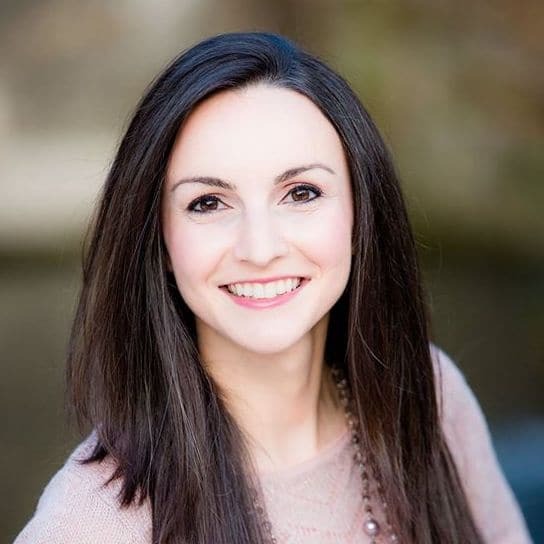 Hello Nell H., I am just discovering your site as of 10.12.18. So I can’t wait to try the potato leek soup, and the Hungarian mosaka. L Central FL, as we may finally get some Cooler Fall weather.